Hey, how's it going? Don't look now, but one whole month just whooshed by! Yesterday, the hamster's sister-in-law got married so I gave him the day off. What a mistake! Trust me, don't ever let your hamster have a day off! Lemme just show you my card. The baubles are purple IRL, not black and blue. Since the title of my post gives it a way, I won't make you guess what's wrong with the perspective on my card. Those are either pine cones on steroids or shriveled balls! We call Christmas ornaments balls in America, but maybe when we are adjectivizing them with the word shriveled, we should use the British word baubles. Thank you, yes. Needles to say, I didn't notice it until after I uploaded the photos. I was originally going to replace the pine cones with baubles, but I couldn't agree with myself on the ornament shapes and embossing, and then I remembered I had these cute little sequint baubles and with no hamster there to stop me ... well, there you have it. Christmas Challenges has an "anything goes" theme. Festive Friday has a photo inspiration of pinecones and ornaments. Merry Monday's challenge is ornaments. Simon Says Stamp Work-It Wednesday. This is a brand-new challenge and for the first challenge we are to share something new. The die I used today is new. For all the challenges, just click on the links for all the details on rules, sponsors, and prizes. The Design Teams work hard to bring you these challenges and they love it when you play along!! Casandra Bennett of Scrappin Bliss. Casandra is a mother of two and a CTMH consultant who has been scrapping since 2007 and stamping and blogging since 2011. She is proficient in both layouts and card art! You'll be inspired and delighted when you visit her! Welcome Casandra and thank you for joining!! The Memory Box pine cone die on my card is NBUS (never-before-used schtuff), which makes this the 100th post where I used NBUS since I started my crusade last June! It's indecent how much NBUS I have (both old and new) and with companies continuing to make great schtuff, I see this as never-ending! Thank you for joining the crusade and using your NBUS, too! Accessories Memory Box "Pinecone Corner"
So glad you clarified things for us Brits. Otherwise, that's a whole new, erm, ball game. And I hope you docked the hamster's wodka ration for the day off. Love the NBUS logo! Congrats. Nice ummm... card. Cherokee left in a hurry. Didn't give him time off. Maw squaw sent him an instagram smoke signal (don't ask) and reminded him of a string of scalps she had. He was out of here so fast his moccasins were left behind. I think she was married before. Kinda quiet around here. Thank you Darnell for spreading your joy and humour - I needed a giggle today and visiting your blog always cheers me up. Well, you're way too hard on yourself - there's nothing wrong small balls! Bwahahahaaaaaa! You're just too funny! Cute card anyway, even if the "balls" have shrunken a bit in the cold....lol! I got tiny baubles so they would be suitable. Glad you did use that word too! Now go and be nice to your hamster and make him a cuppa! PS, have you been to the Playground today? Oh my goodness - you're so funny! Going off to check out that new SSS challenge. I agree with you on the NBUS! Ornaments come in all shapes and sizes so you're okay. (see my post about "okay") lol You have more NBUS than I have in my entire stash I think, even when you count every little stamp in a set. I may be catching up though. Hugs and have a super weekend! This was certainly an entertaining post, to say the least! I love the pretty green branches against the bright white of your card and the off-center placement of all the details--it's so creative! Thanks for playing along with Festive Friday this week, Darnell! Very pretty! Love all the pinecones and pretty bulbs! I would never, never, never, NEVER count my NBUS. In fact, I'm starting to cringe that I mention it on my blog. Not that I care what you and my fellow crafters think, but hubby reads my blog!!! I love the pine tree and cone die. I see lots of potential for that. As for the shriveled "baubles" (so that's what they are calling them these days?) I think you can see a doctor for that. Another fabulous card, Darnell, along with an entertaining post. 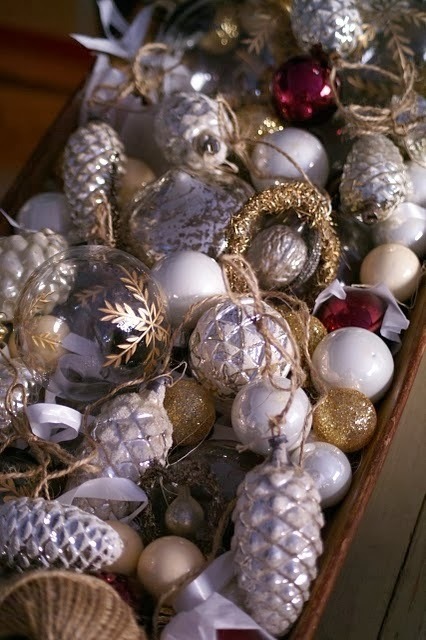 Your shrivelled baubles look perfectly fine with your pine cones! Thanks so much for joining us at Merry Monday. Oh Darnell, leave it to you to figure out a 'shrivelled baubles' card! I now see it completely differently! I love the shape and shine of the ornaments and the way you've hung them ('well hung'?!) on the needles. See what you've done? My mind is in the gutter! lol! Needles to say, I also love the clean feel of this. thanks for joining us at Festive Friday! And for the giggle! Lol I didt even notice the small ornaments until you pointed it out! It's a cute card anyway!! I think it is time I got my act together too and started using NBSU stuff. In fact I think it is time I got my act together full stop. hehe shriveled balls sounds a tad painful - I'll assume the pine cones are drugged up!!! (although my favourite baubles for my actual christmas tree are always the diddy ones!). I think this is a beautiful combination of elements from nature, and the little balls are the great details that give this design the Christmas feel. I really like it! So fun...and what a fabulous little card! I love those pine needles. Congrats on your 100th NBUS post too, who know such a fun thing would catch on like it did. I love it! Oh, Darnell, you're too funny. I have lots of little "baubles" on my Christmas tree and they look just like this! So I think it's a fine card, especially with the pretty blue you've used. We are so glad you played with the Merry Monday challenge this week! You always make me laugh Darnell! Fantastic card today, I love the scene you created with your balls! ROFLMAO!! Shriveled or not.......it's gorgeous!!!! Gotta love those balls! Oh, Darnell, you and your hamster! Those pine cones don't look shriveled! Love the little ornaments hanging on the pine boughs. Glad to know they're purple and not black and blue! I'm so glad you brought this by to share with us at Merry Monday! Sweet….love your focal point agains the stark, crisp, white. Really a striking card! Oh, Darnell, you are a hoot! I am glad you posted this (you are too hard on yourself), especially considering the time you put into it. Oh Darnell, you are too funny, I would of said the baubles were blue and green but that's just me. Sometimes when you use a new die you just have to go with it, I think the card design really made the pinecones pop. Well Dippy, I thought they were little jingle bells as well.......strangely although they look a little small on the close up they actually look okay on the longer shot.....so shrivelled or not they look fine! Gotta feel sorry for that hamster...:-) Congrats on your 100th NBUS post. oh em gee, I snorted hard enough that I have to change my shirt. Shriveled baubles indeed! You fussy cutting QUEEN! As Wayne and Garth would say: "I'm not worthy!" LMBO at your musings! But of course you're gonna have shrunken balls - it's the middle of winter! LOL! Hi Darnell, Thanks for visiting, and your lovely comments. Love how your refered to your baubles as 'pinecones on steroids' - I hadn't noticed anything wrong! Great Card Darnell and Congrats on your 100TH! Love the card. I have teeny baubles that I hang near the top of my tree. The ornaments get progessively larger towards the bottom of the tree. You always manage to bring a smile to my face every time I visit your blog. Congrats on your 100th NBUS...and you have inspired me...I've been trying very hard to use my NBUS too. And Congrats on you Dynamic Duos win. Your card was great! OMGosh, your 100th NBUS post? Good heaven's girl...that's a LOT of new schtuff! I don't care what you say, I think your 'baubles' are beautiful! You couldn't make a bad card if you tried...not even this one! So go ahead...get that hamster back into your craft room, even if it's just for company, because heaven knows you don't need him! Thanks for another great (and FUNNY) post, Darnell! Honestly, I think that your card looks great! I love that you varied the color of the pine cones and the pretty little sequin 'decorations'. Fabulously clean & simple! Those baubles are really neat looking & if you didn't see a problem until you looked at the picture, then the picture just gives a different look & in person it's great! Remember that, my friend! Amazing to use NBUS so consistently--good for you! Cute baubles and love the clean designer, Darnell! Your baubles look fine from where I'm sitting Darnell! I love your design and fabulous use of NBUS - WOW congrats on making it to 100! Thanks for starting my day with a huge smile your so funny, even without the hamster I think your card is brilliant, I love it, and your right Casandra does do beautiful layout and cards, thanks for sharing and hope you have a wonderful day, ((( BIG HUGS)))..
You are hilarious!! I love your card regardless of what you call them!! Fabulous!! Great job using up your schtuff !! Your baubles look fine to me.. Every lady should have a nice pair, I do believe! !